Look look look! Becky sent me presents! They are so wonderful and pretty! This silk mohair blend is soooo gorgeous! The photo doesn't even do it justice. 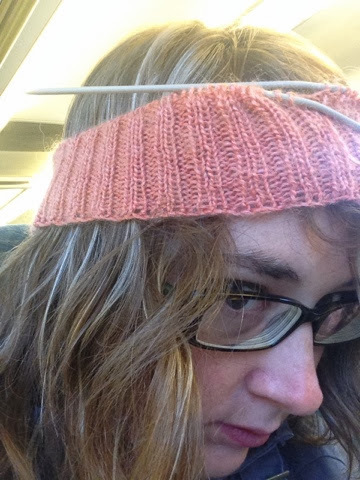 I know exactly what I'm going to make with it: the simple pleasures hat from Purl Bee. It's summer, but I don't see that as any reason to stop knitting winter items! I generally take so long to finish a project that it's the next season along anyway. Actually, usually it's a year and a season! And the washi tape is perfect. 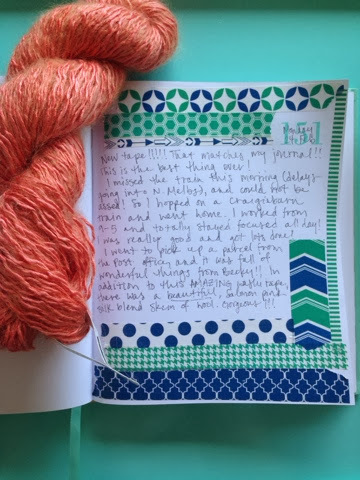 It matches my journal! And there's so much of it! Becky has doubled my washi tape stash in one swoop. There are other exciting goodies too, like some color printed labels (are they from French Linen or something like that?) and some really sweet earrings. Thank you!!!!!!! Yaaaay! I'm glad you like the presents! I was worried the pink yarn wouldn't be enough for a project--I don't know how far yarn goes. I looooove Purl Bee projects.